Apple has made Apple Watch Series 2 official. Here are its features, price and release date info, in short, here’s everything you need to know about the second-generation Apple Watch. It was almost two years ago to the day that Apple eventually let the cat out of the bag and introduced the world to the first-generation Apple Watch. It was another seven months before it actually started adorning physical and digital shelves, as well as people’s wrists, but we now finally have confirmation, as well as our first glimpse, at the second-generation Apple Watch which is referred to as the Apple Watch Series 2. Despite the fact that Apple’s smartwatch has spent nearly two years without an upgrade, the next iteration of the device wasn’t initially expected at the company’s fall event, which is usually set aside for the more dominant iPhone lineup. Many likely didn’t think Apple would want its most popular product to share stage time with its wearable, but here we are. The features, price and availability of the new Apple Watch have been laid bare, and we’re going to give you a rundown of all three right here. Design wise, the Apple Watch Series 2 is instantly recognizable as the older brother of Apple’s first wearable. With that said, it doesn’t mean that Apple hasn’t made changes where they were needed. The Series 2 is completely re-engineered from the inside, with the only exception being the ceramic white Apple Watch Edition. As expected, the Apple Watch Series 2 packs a Dual-Core S2 processor which makes it 50% faster then its older sibling. The new GPU brings 2x the performance of the first-gen Apple Watch as well. The display on the Apple Watch Series 2 is now 2x brighter than its older sibling coming in with a brightness of 1000 nits, great for outdoor viewing! Apple says this is the brightest display that they have ever shipped in any of its products. Anyone purchasing the Apple Watch Series 2 will get a smartwatch with an integrated GPS chip for activity and location tracking independently of a connected iPhone or iOS device. The watch also stores GPS data locally so that you can get started with your run or workout session almost instantaneously without having to worry about getting a GPS lock. Battery life is always a concern with any mobile device, be it a smartphone or a smartwatch. Apple might not be anywhere near solving battery issues and having that elusive everlasting device yet, but when operating in conjunction with a more efficient watchOS 3, it should give some improvement in uptime. Although Apple says Watch Series 2 gives same battery as olden-gen Apple Watch. 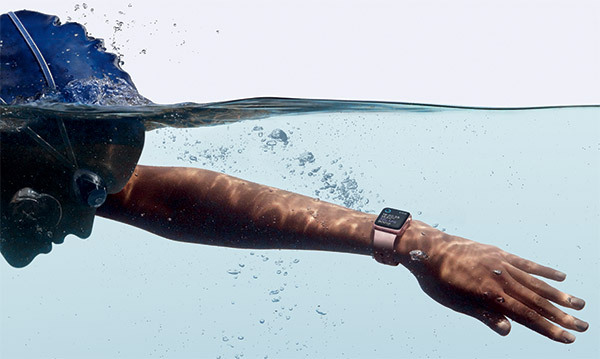 Gone are the worries of getting overly excited on vacation and jumping into the pool or sea with your Apple Watch still attached to your wrist. 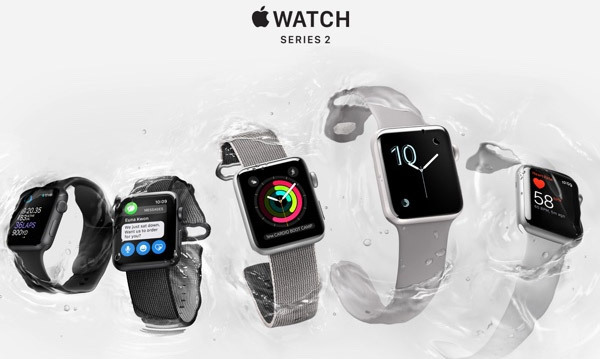 It seems that the world is fixated on making mobile devices waterproof, and Apple has duly obliged with the Apple Watch Series 2. The watch is now good for wearing while swimming, diving into the pool from a height, and can stand a depth of 50m. Apple has also redesigned the speaker here, which can work to pump out the water collected into that space. Genius! Apple makes no secret of the fact that it likes to get the most out of its products by marrying hardware and software together in perfect unison. With that in mind, the Apple Watch Series 2 will instantly benefit from all of the improvements brought about with the release of watchOS 3. With efficient and instant app loading, new watch faces and experiences on offer, this new Apple Watch has it all, thanks to watchOS 3. The Apple Watch Series 2 now has a range of models. In addition to the stainless steel and aluminum builds, there’s now a new white ceramic build as well, which as you guessed, is now the Apple Watch Edition, which replaces the 24K gold plated version from the older-generation. If the Apple Watch Series 2 has piqued your interest, you might want to manage your expectations when it comes to its accessories. Nothing new here, really. As expected, to bolster the Apple Watch 2 proposition, Apple has announced a slew of new Apple Watch bands to accompany the launch. Apple Watch Series 2 may be new and shiny, but the price tag to accompany it is still there for all to see. Anyone who has been waiting for Apple to announce this new version, or who has the first Apple Watch and will be looking to upgrade, can expect to part with upwards of $369 for the 38mm aluminum model and $399 for the 42mm aluminum one. Stainless Steel version starts from $549 for 38mm, $599 for 42mm. Different band combination are available for additional cost. Apple is also upgrading the first-gen Apple Watch with the new dual-core S2 processor and calling it the Apple Watch Series 1. 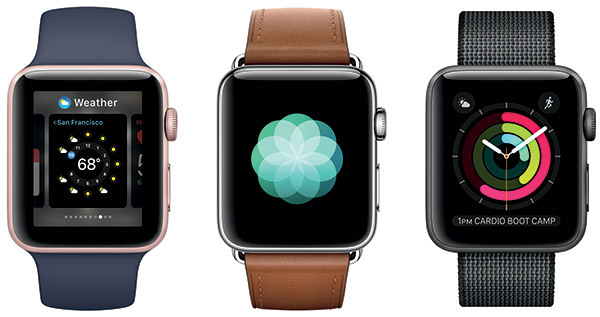 The Series 1 will now come in at a starting price of $269 for the 38mm model and $299 for the 42mm model. Series 1 is now available in aluminum finish only. The new Apple Watch Edition (ceramic) starts at $1,249 for the 38mm model and $1,299 for the 42mm model. The Apple Watch Nike+ comes in at $369 for the 38mm model, and $399 for the 42mm model. Apple Watch Hermès is available in two different case sizes, 38 mm and 42 mm. The 38 mm Single Tour is $1149 (US); 42 mm Single Tour is $1199 (US); 38 mm Double Tour is $1299 (US); 42 mm Single Tour Deployment Buckle is $1399 (US); and 38 mm Double Buckle Cuff is $1499. Apple Watch Nike+ will be available for pre-ordering from September 9 with availability expected in late October. Apple Watch Hermès will be available starting September 23. 50m depth , that is what if not waterproof?? ?